SheriDawn Neilson is an Assistant Professor in the Nursing Department at Southern Utah University. She received her Bachelor of Science in Nursing from Southern Utah University in 2007. She earned her Masters of Science in Nursing with an emphasis in Education from Walden University in 2015. She maintains an advanced certification as a Certified Emergency Nurse. She also holds several other certifications including Trauma Nurse Core Course (TNCC), Advanced Cardiac Life Support (ACLS), Pediatric Advanced Life Support (PALS), Neonatal Resuscitation Program (NRP) provider, Basic Life Support (BLS) and National Institute of Health Stroke Scale (NIHSS) certification. 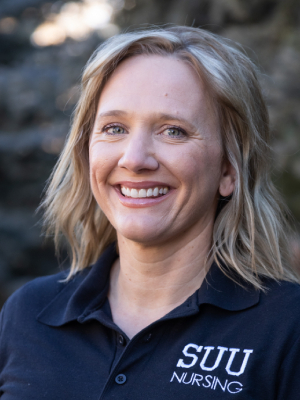 SheriDawn has eight years of experience in clinical nursing including critical care & trauma air transport, intensive care, emergency department and administration. She remains current in her clinical practice as a Flight Nurse for Classic Air Medical and as a House Supervisor for Cedar City Hospital.